Saint Catherine's Church in East Keansburg has an interesting history. As a Parish church, it is the youngest in Middletown Township, established ten years ago. The decree for the erection of the Church was given by the Most Reverend Bishop William A.Griffin in June l7, 1948. The first Pastor assigned was Father Frances P. Gunner (now pastor of the Sacred Heart Parish in Mount Holly, NJ.) The first trustees were: Thomas J. Malone and William J. Conery. Saint Catherine's Church for its early history reaches back to August of 1937, It had a humble origin. It began in a "barn". At the prompting of some ardent and zealous Catholic families, the idea of having their own Mission Church became a reality. Mrs. Marie S. Lederhaus, James T. Carton, Mrs. Johanna Rich, John Murphy, Mrs. S. Patterson, Peter Moran, Frank Vogel and Mrs. H. Madden approached Father Lucitt with the plan. 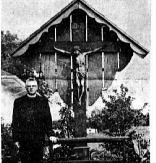 Father John Lucitt, then Pastor of Saint Ann's Church in Keansburg, with the aid of James T, Carton, investigated a piece of property in East Keansburg burg, known as "Kilpatrick's Barn and Carousel.'' This property was purchased with espicopal approbation, for the sum of $3,000 for the property and $500 for the wooden structure know as the "Barn". Here divine services were held only during the summer months of July and August in every year until the first pastor was assigned. The priests who conducted services at Saint Catherine's Church were priests of Saint Ann's Church in Keansburg. Their names deserve to be inscribed into the parish history of Saint Catherine's: Father Norbert F. Wagner, Father Joseph Chmielewski, Father Adolph Czelusniak, Father Robert Aird, Father Charles A Dunstan, Father George J. Kraft, Father Francis Piccolella, Father Stephen Buividas. It remained however, for the first Pastor, Father Francis P. Gunner to transform and renovate the "Barn" into the beautiful church of Saint Catherine's of today, Father Gunner was a priest of unbounded and tireless zeal The Parish of Saint Catherine's can never repay Father Gunner for his hard labor of love done for his God and for his people. After seven years of fruitful ministry, Father Gunner was assigned to the pastorate of Saint Joseph's Church in Washington, N,J. His successor as Pastor of Saint Catherine's designated by His Excellency, Bishop George W. Ahr, is Father Thad J. Wojciehowski. He was nominated Pastor May 4, 1955. A new addition was made to the Sacristy. Considerable real - estate was bought. The rectory was moved from the old site of 110 Hudson Ave. to the present site of 5 Shore Acres Avenue. The Murphy House was bought and serves as a catechetical room and for society meetings. The interior of the Church was renovated and painted. A Bavarian outdoor shrine was erected. The brief outline above makes no mention of the warmth and vivacity Father Thad, for no one calls him anything else, has brought to his parish. The blonde, six-foot-two priest who is so used to being called Father Thad or Father Ted, can't traverse the half block from his home to church to parish hall without returning warm greetings from mothers pushing carriages, boys riding bikes. His item no. 2 in the official history above fails to mention why wash room facilities were installed but he explains unofficially "Our children quite often had to use the wash room facilities in Murphy's across the street, and I didn't like the idea of the condition they sometimes saw on a Sunday morning after a Saturday night at that festive place, "
As to item No. 4, on the moving of the rectory, Father Thad and his mother live now directly across the street from the church because "It is a parish of small bungalows where the people their priest and church (are) together. There was talk for a while of building a new rectory, but I would prefer to live as the majority of the people of my parish do." It is Father Thad's mother who is responsible for the beautiful flowers that grace the grounds of Saint Catherine's. She is a dedicated gardener and believes It's a real miracle with all the bicycles the children ride that our flowers continue to grow and prosper. In Item number 5 Father Thad mentions the purchase of the Murphy House. This has become a real center of youth activities for the boys and girls of East Keansburg. Father Thad estimates that at least 200 teen agers participate in baseball and basketball leagues, teen-age dances and other activities designed to give youths of that age a meeting place because as Father Thad explains " I become quite angry when people say "those kids from Keansburg' in a derogatory tone, All children are so lovely and naive. So good. The brightest parts of my day are when a child will tell me in the same breath that 'Mama had a new baby and we have new kittens' and I can say, 'Isn't that lovely' and mean it." When Murphy's hotel and bar was purchased, 51 men and Father Thad spent a year renovating it for Church purposes. Now the just-past-forty Pastor dreams of the day when a school can be started in Saint Catherine's Parish which now serves 600 families .